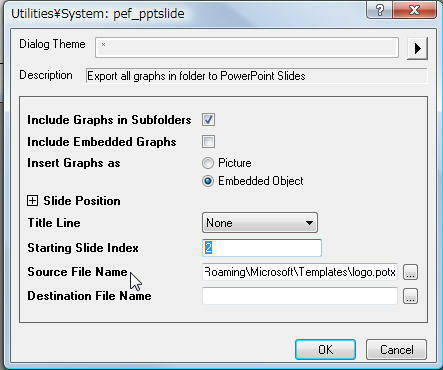 Origin supports sending graphs to a blank Powerpoint file, an existing Powerpoint file or even a Powerpoint template. This blog will show you how to create a powerpoint template with company logo and send Origin graphs to it so each slide contains the company logo. The procedure is based on Office 2010. On left panel, choose the topmost slide. Use Insert tab and click Picture button to insert company logo. You can move it to expected position. 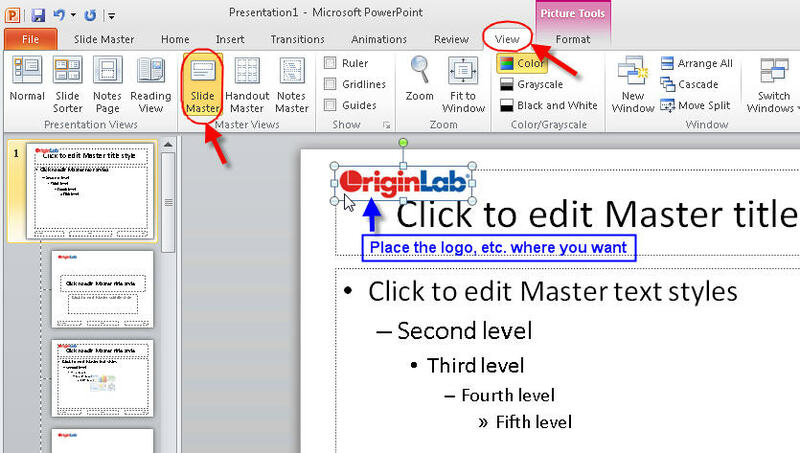 All slides you add in your presentation are based on the slide master and associated layout. Go back to SlideMaster tab, and click Close Master View button to see the effect. 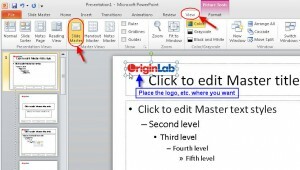 You can search help in Powerpoint for more information of how to customize Slide master. 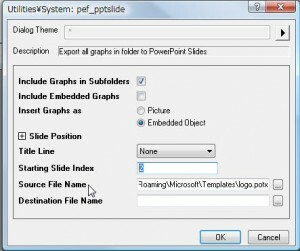 Graphs you want to send to Powerpoint are not in same folder. In such case, you can first create shortcuts of all graphs you want to send to PPT to Favorites folder in Project Explorer. Adjust the graph order there. Then send them to PPT. Create Shortcuts for desired graphs to Favorites folder: Right-click each desired graph window title and choose Add Shortcuts to Favorites. Control slide order: Go to Favorites folder in Project Explorer. Make sure the bottom panel of Project Explorer is in Details view and Slide column shows. Click Slide column header once so the shortcuts are sorted by Slide. You should see 1, 2, 3 listed in Slide Column, which indicates the slide order. Drag shortcuts up and down to adjust the slide order. 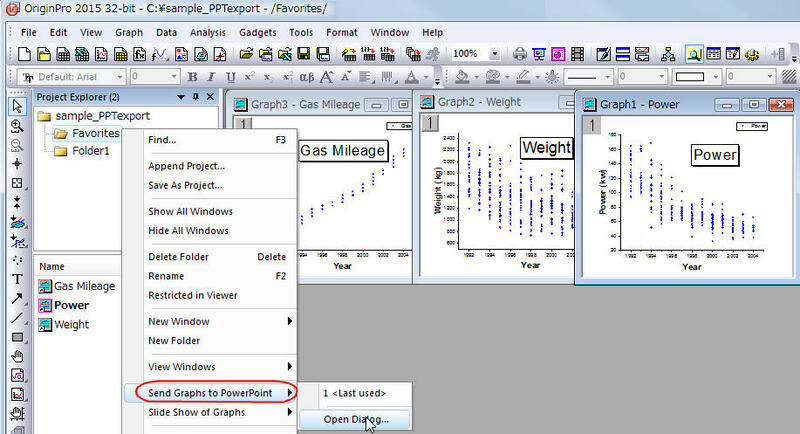 You can also right click a shortcut and choose Skip Slide so that graph will not be sent to PPT. Send Graphs to Powerpoint: With Favorites folder active in Project Explorer, click the Send Graphs to Powerpoint button or right click blank area in Project Explorer and choose Send Graphs to Powerpoint context menu. Specify the Powerpoint template in Source File Name field. Also, we suggest you enter 2 in the Start Slide Index field, so that you can keep the 1st title slide in the powerpoint template file. Origin also has master page feature to add company logos, etc. 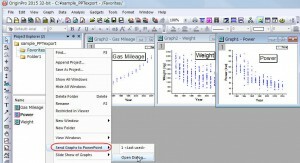 to all graph windows in a project: http://www.originlab.com/doc/Quick-Help/add-master-obj. But by creating Powerpoint template with company logo, etc. your can keep your Origin project clean and generic. With PointPaint, you can save a presentation to any of the file types listed in the table below. Will this work with Powerpoint templates like Instapoint at https://instapoint.co? I see no reason that you would be unable to use the template created via the third party tool like yours as long as it is compatible to the regular PP template, though I have never used the templates from InstaPoint. If you don’t have Origin License to test, please download the latest demo/evaluation version of Origin from https://www.originlab.com/demodownload.aspx . You can set the location of your template at Step 4). Please try.